Subscribe below for email notifications when changes are made at Serota Massage Therapy. Reiki is the lifeblood behind all of my other services. 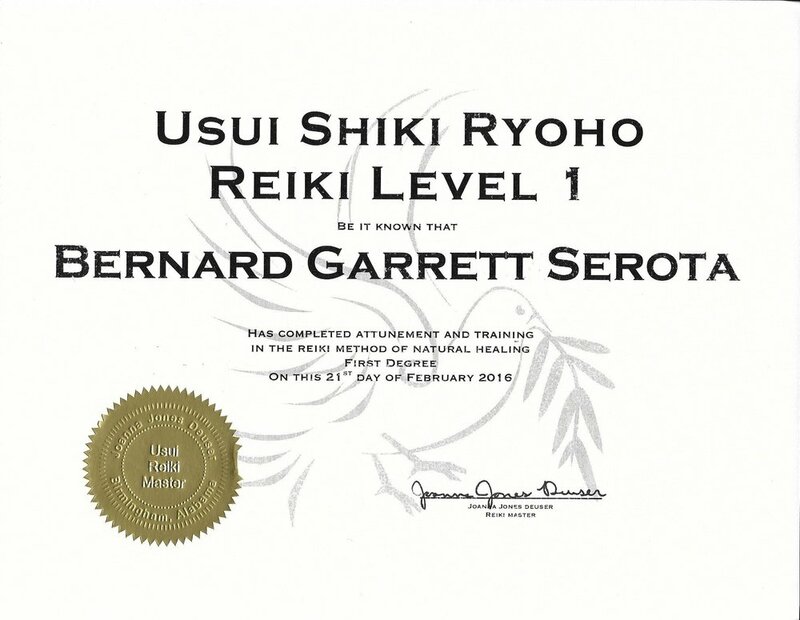 If you have been paying attention to my training, I have paid to take and RETAKE more Reiki Classes than any other courses or disciplines that I have pursued. Seriously, I have taken the first level training twice over because I found so much worth in it. I really felt that I needed to because I was so blown away with my personal experiences receiving the training, how it helped me, how it changed the way I experience my craft, and most importantly in how it was IMPROVING the quality of the therapy I was providing as well as shaping my very intention to do what is best for my clients. And I learned even more from repeating the training, so I did the same with Level Two course. The choices did not disappoint. To really drive my point home, also pay for and receive more Reiki sessions for my personal therapy than I buy and receive massage services or cupping sessions on a fairly regular basis. Moreover, I do more Reiki self therapy than I do foam rolling or using my own cupping equipment on myself (which is fairly easy and feels pretty good). The deeper into Reiki I go, the more powerful and beneficial it is. I literally do Reiki every day. If you are my customer, I’m balancing myself with Reiki before coming in the room to begin your service on you. If you ever wonder why I so easily locate problems, it’s honestly and truly because of my Reiki training and how it has changed my sensitivity to a broader spectrum of problems. Your problems literally stand out often they can’t be ignored. To a certain extent, I’m doing a little Reiki all throughout any of your massage sessions, during cupping blankets, and Reiki is the soul driving force behind my Craniosacral and Somato-Emotional Release sessions (the technique is the modality, but Reiki is the gas thrown on the fire), as well as applied in any acupressure and meridian work. If you have been on me table, you probably have unknowingly received a little Reiki., of today, I have taken the Reiki Level One course twice and then followed suit in taking the Reiki Level Two course twice as well. I hope you are beginning to see that I respect this therapeutic modality very much. I will be updating the Service Description for this service and you are welcome to ask me any additional questions. Reiki is unlike any of my other therapies in that it can reach far beyond any of them and minister to you not only on a physical level, but also on an mental, emotional, and spiritual level. I am not done studying it by far! New Changes This March at Serota Massage Therapy! As usual, I've been working way too hard... but I've got a few things to show for it! Two more classes down. I have recently completed the second level courses of both CranioSacral therapy and Reiki, and they have been added to my service menu and my service descriptions have been updated. 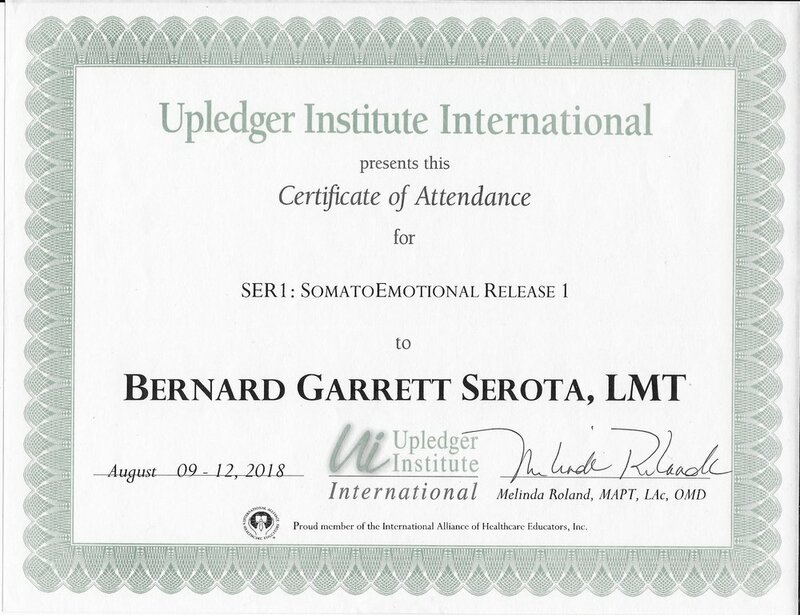 I'm happy that these levels come with titles, since I'm now a "Reiki Practitioner" and a "CranioSacral Practitioner." I know it's not remotely important, but I'm excited about that! There are also several beautifying & toning services that have been added with their own service category. In general, I've given my service menu an overhaul and there are many new options. Maybe you will find something you like! And just a side note... I'm coming up on a 9 day personal leave (March 17 through March 25th) that's been notated on my scheduler for the last four months. I will be closed and out of contact (really and truly). It's expected that I will have zero communication ability, so please don't be offended by my extended silence. I am not ignoring you... I have no cell service at all and no ability to respond. You will be able to book any appointment slots through my scheduler for when my business reopens and I will be approving all pending appointments on the 25th. Holiday Special: Get 10% off your service PER every gift certificate you purchase during December. This discount is cumulative with multiple gift certificates purchased at one time. This applies to gift certificates purchased both online and in my office. The discounted service must be used this month. And lastly, upon entering 2018 and my fourth year of business, there will be a small price increase of $5 per hour of massage services. All other services will be adjusted per that ratio. Cupping blanket prices will remain unchanged. I greatly appreciate all of my clients and your continued support. Please understand that I have been charging $10 below the average independent therapist in Birmingham (including everyone who shares my office suite for YEARS now) and well below the average spa, hotel, and gym rates... and I work far harder than most for quality and continued educational training. Hopefully this will be the last schedule change for a while, but I have made some days more convenient for those who prefer morning appointment times and others for after work/evening appointments. TMJ relief massage is now available. If you or anyone you know struggles with chronic jaw, neck, facial pain or migraines in the facial/sinus area, this service may bring substantial relief to their issues. NEW CANCELLATION POLICY: I'm still remaining very lenient on my cancellation policy. Those who do not cancel their appointments and do not show up will be expected to pay for the missed appointment in the full amount in the event that they book with me again. Those who cancel in less than 2 hours before their appointment will invoiced for a $35 late cancellation fee. NEW GIFT CERTIFICATE POLICY: Gift Certificates expire 1 year from the purchase date. Gift certificate sales are non-refundable. In the event that a gift certificate was not used by the giftee, Serota Massage Therapy will contact the buyer via email on the January following the certificate's expiration and present the opportunity for the buyer to use the monetary value towards a service during that month. After that period, expiration is final. I will be closed next week on August 23rd-25th while learning and being certified in TMJ (jaw/neck pain), and will be happy to include this new approach when needed in any of your future sessions. But keep those dates in mind when booking your next appointment. Don't wait until it's too much to book again! Website overhaul! Please be patient with my tinkering, but it's long overdue! My schedule has changed. Currently, I'm working Mon/Tue 12:00-8:00, Wed 2:00-8:00, Thu/Fri 10:00-8:00, and Sat 10:00-6:00. I will be CLOSING on Saturdays when college football season starts. Last year, it went from being packed to dead. This season, I will expand my hours throughout the week, but working Monday through Friday since weekends will have little demand. Visceral Manipulation Training: I took a class studying how the abdominal organs have a range of motion as well as ligaments/membranes/connective tissues that are also subject to tension. This creates back/side/pelvic referral pains from the inside. It was a surprisingly beneficial course since it solved a personal issue of my side pain, which I assumed was from my oblique/ab exercises... but turned out to be my large intestine anchoring to the inside of the rib cage. I learned a lot.